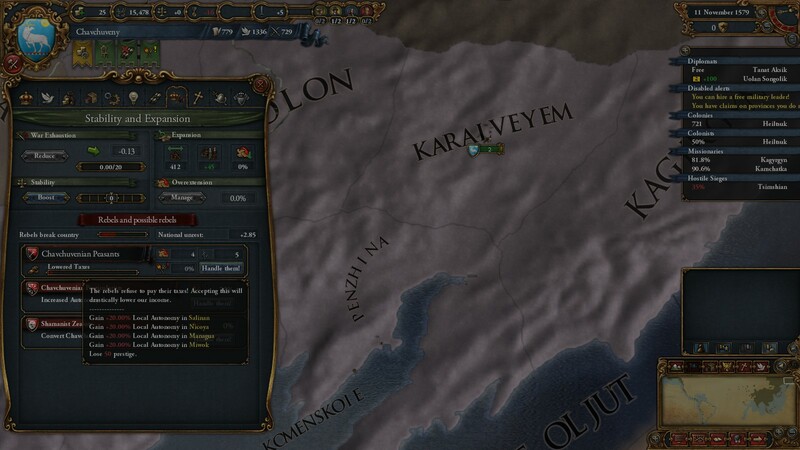 So I decided to try my hand at a siberian tribe and document my game. Honestly this playthrough is one of the most fun I've had in a long time. 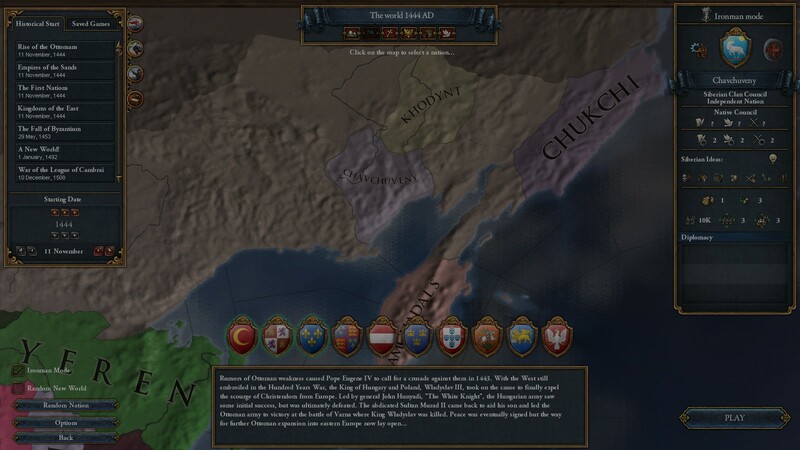 Siberian tribes are one of the hardest nations to play as, arguably the hardest nations. 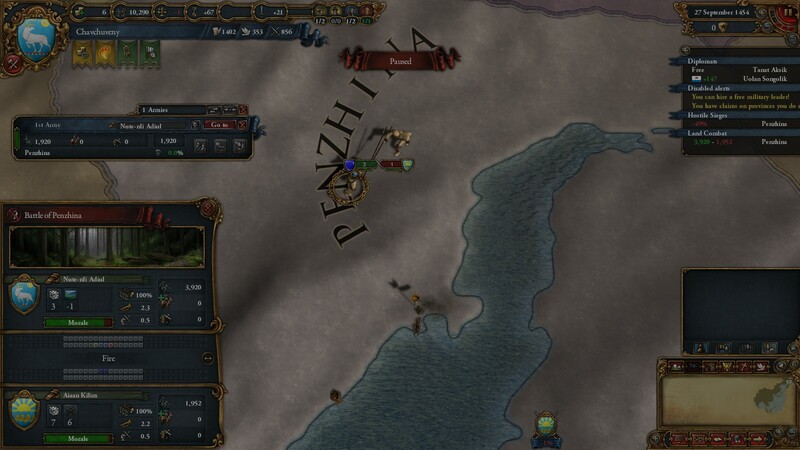 Whilst there are a lot of games that are harder to start (Albania for instance), generally once you get a good start in EU4 the rest of the game becomes quite easy. Not siberia! Because there's no easy way to expand and all the provinces around you are poor as dirt, the game stays hard for a long time. Nobody would have expected that the greatest nation this planet has ever seen would emerge from the wastelands of Siberia. That's because it's a ridiculous idea; Chavchuveny is poor as dirt and and technologically backwards. Nevertheless! This is where we make our stand in history! Onwards to glory! 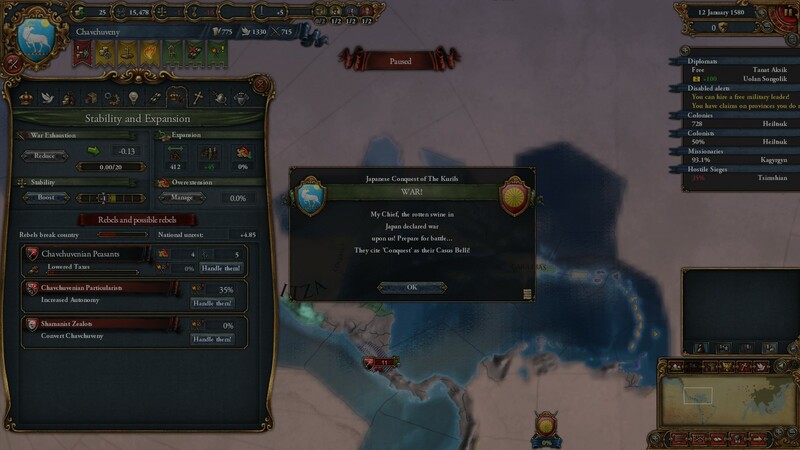 Starting out, we only have one neighbour in the whole wide world, so the obvious course of action is to kick the crap out of them and make them kneel before their rightful overlords! Speaking of money. The strategy for this playthrough is to try and make a 'tall' nation by investing heavily into infrastructure. 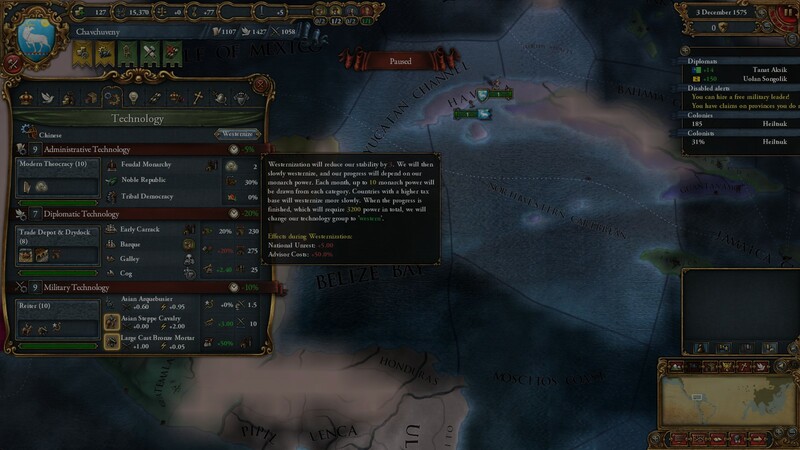 Our provinces have crap base tax and the colonies have 50% autonomy, but the goods they produce are valuable so I plan to invest heavily into production buildings. A mere 40 years after the game start and we have a colonist! We start our slow inexorable creep across Siberia in order to fuel our ambitions of greatness. Our colony has a negative annual growth rate because we're broke, but the colonist attracts enough people to keep the colony growing. 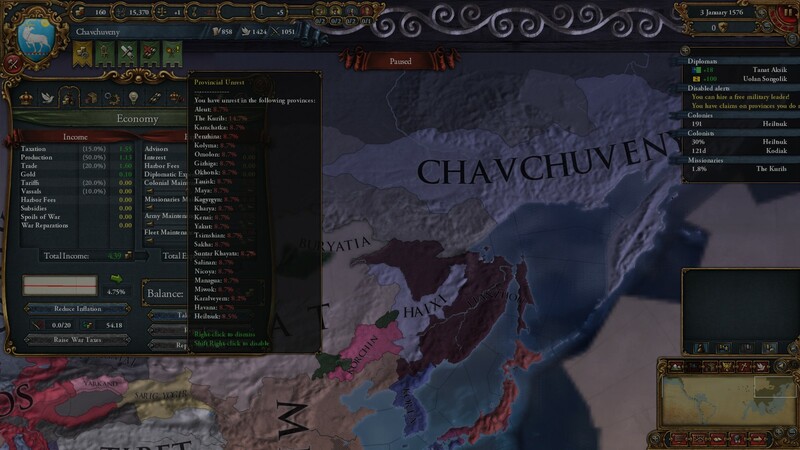 Off-screen, I forgot to screenshot the great Chavchuvenian conquest of Ainu. Ainu was as piss-poor as we are, so I took the opportunity to relive them of the burdens of leadership. 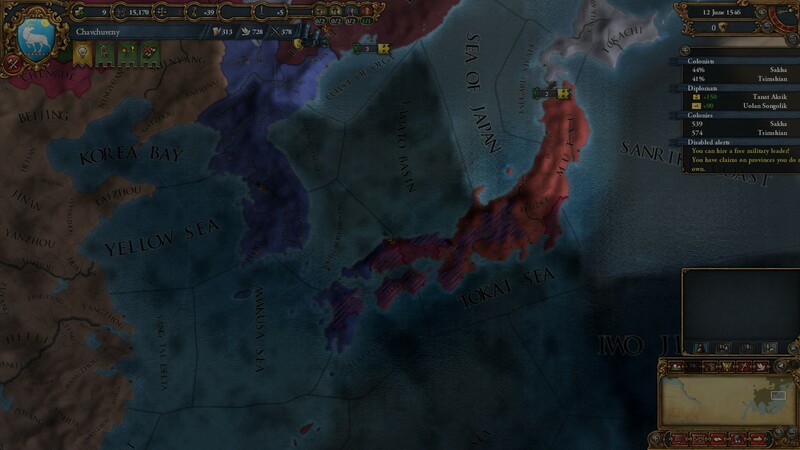 Unexpectedly, Korea has gained the upper hand in a regional power struggle and is beating up Japan. We should capitalize on this! Ha, who am I kidding, we have 3000 men and a leaky boat to our name, even a weak and crippled Japan would destroy us. 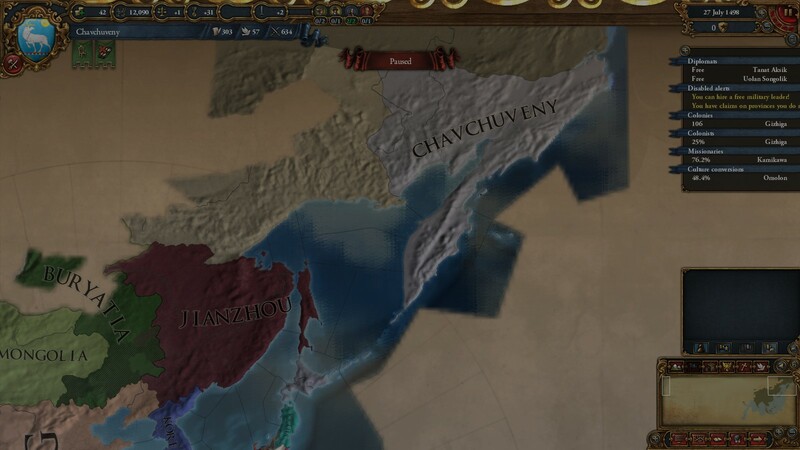 The Chavchuvenians have discovered the New World! 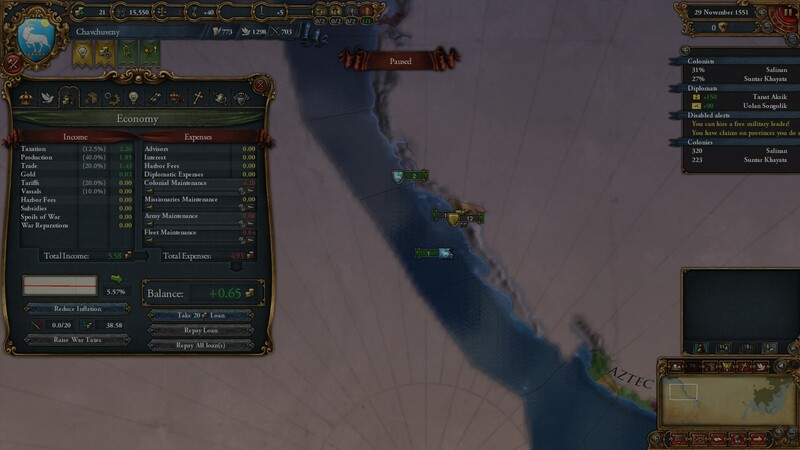 We creep our colonies down south to sunnier shores, everybody is fed up of being cold all the time. 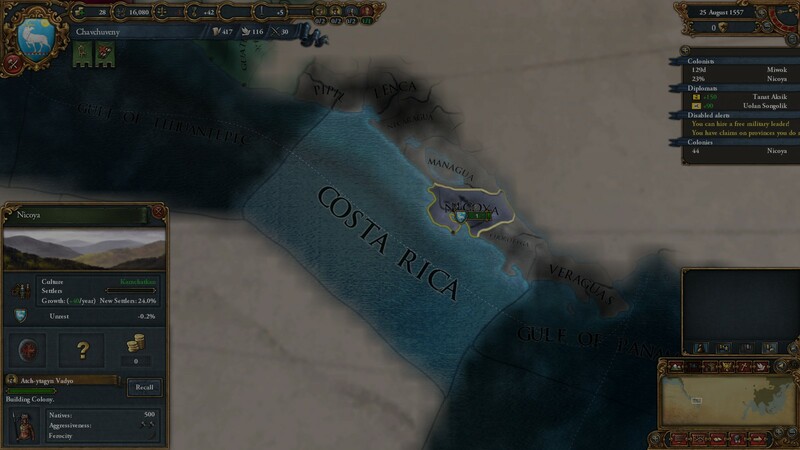 After this, we colonize Mangua, which has an atlantic-facing port. Next stop, the carribean! AAAAAH! Run for your lives! 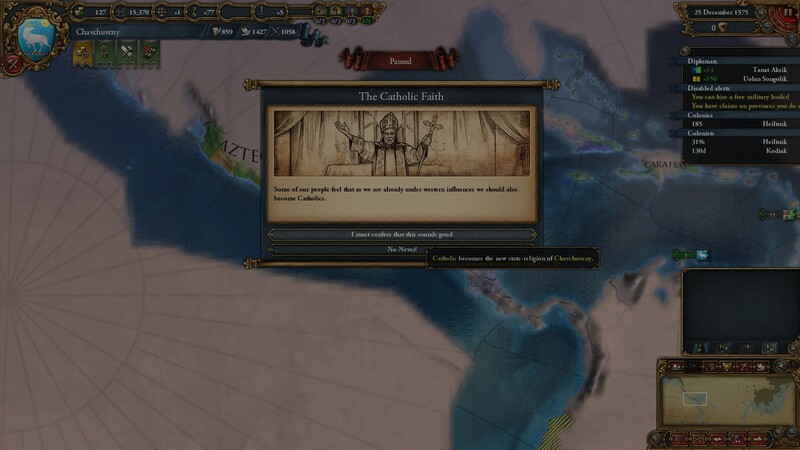 I didn't want that land anyways... *cry*. 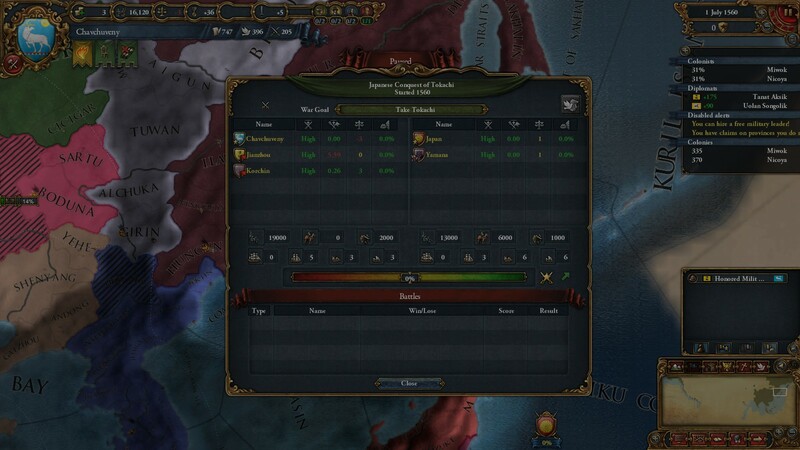 This was about the best deal we were going to get, because once they got the wargoal the ticking warscore advanced in their favour. We reconquer Chukchi (a siberian tribe) in short order and lick our wounds. We've made it! Our sunny Chavchuvenian holiday resort has started up and is almost complete. The neighbours barely acknowledge our existence, but seem friendly enough. They also have a lot of knowledge we could benefit from..
And so it was, the siberian Chavchuvenians cast aside the old ways that had served them so well for centuries, and began the wholesale adoption of European traditions and technologies. 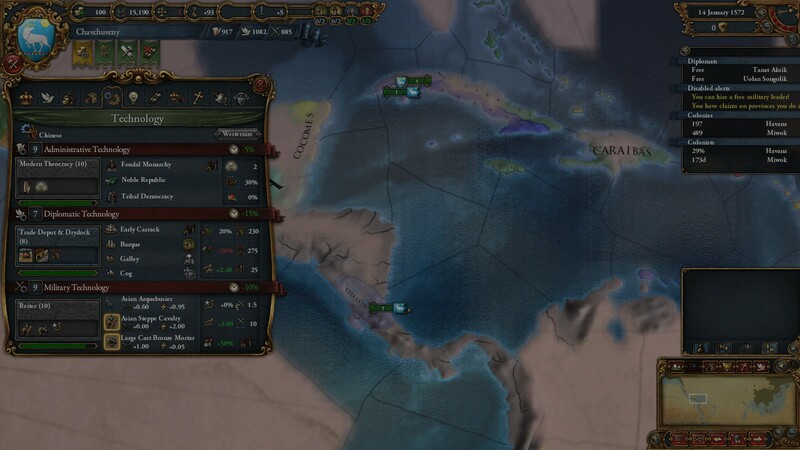 Also, our guys in the Caribbean must be a bit hot under all that arctic clothing... Old habits die hard. 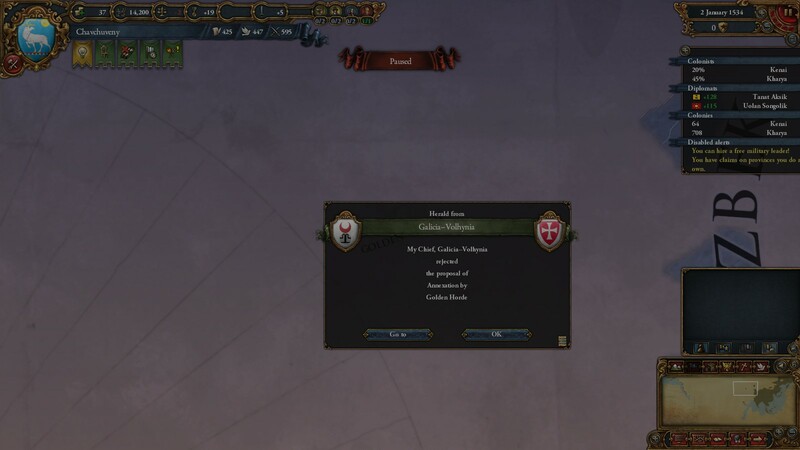 The Chavchuvenian's newfound Catholicism didn't even last a day, however, when the chief heard news of the heretical Calvinist faith. Now it all made sense, of *course* the Chavchuvenians were predestined to go to heaven, we are afterall the centre of the world. 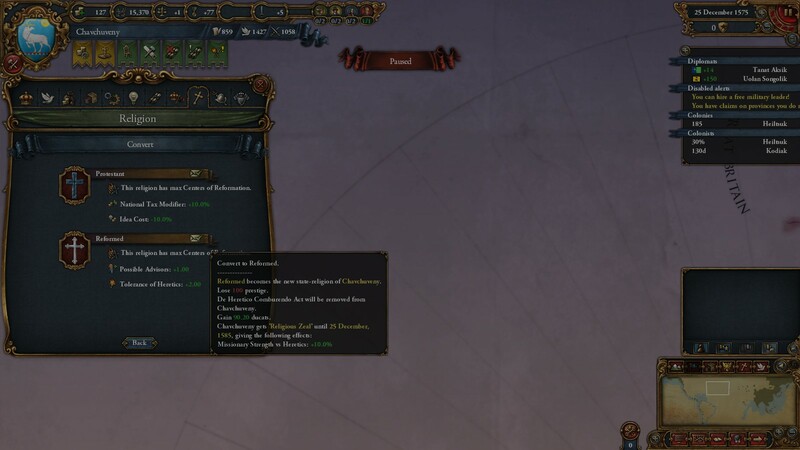 Plus that trade power is excellent. The peasants have revolted! The sky is falling! They all revolted in the New World, and I lack the transports to fight them! 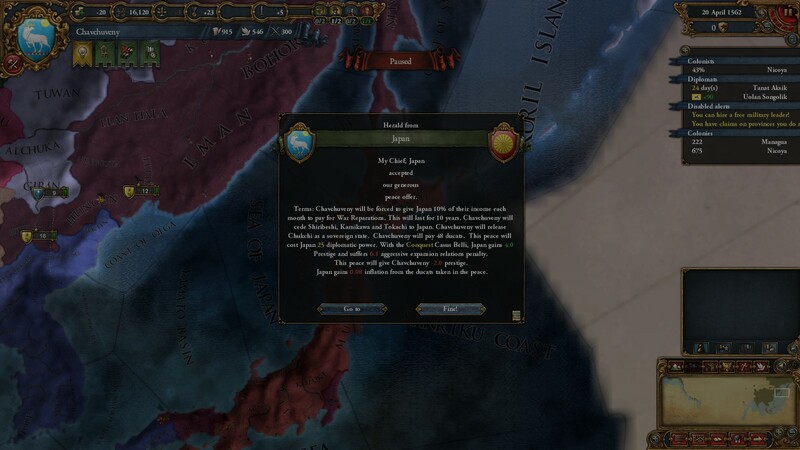 The rotten Japanese, not content with Ainu, lay claim to our ancestral holdings and attack! 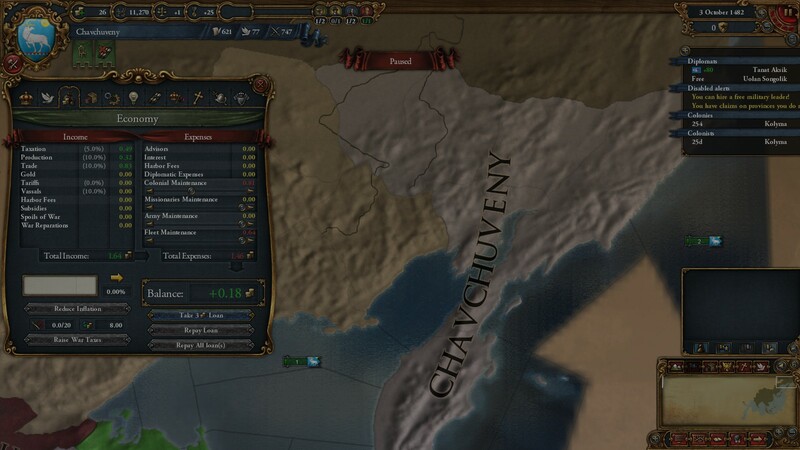 Will Chavchuveny survive? Can we weather the storm and westernize? Is this all a pointless endeavour because of the inevitable Russian bear? Find out in the next installment!